What's NOT green and red and Santa all over? Both David’s and my parents got married in December, which has got to be super unusual. When we got engaged, David was in law school, which meant that if we wanted to take a post-wedding honeymoon (we sure as hell did), we needed to plan the wedding for a law school break—December or summer. December had an immediate lure. First, it wasn’t eighteen months away (we didn’t rightly figure we could pull off the wedding we wanted in six months, leaving us with an eighteen month lead time on summer). Second, it was family tradition. For both of us. For as long as I could remember, my mom had told me to get married in December, when the church was already decorated, at no cost to you. The only trouble was, we weren’t getting married in a church. Our little interfaith family was having a Jewish wedding. When you have Christian and Jewish backgrounds, December is a minefield. So as much as I would have enjoyed a nine-month engagement and a December wedding, we nixed it almost straight away. The biggest reason? Decorations. Having, at that point, weathered several Decembers in our relationship, I could see how a winter wedding was going to play out. There would be fights over evergreens. Is it, “simply a seasonal plant,” or “a really Christmas-y plant”? I’m smart enough to avoid Poinsettias, but it’s hard to totally avoid red. And green and red would have been out, but would blue and white be just erring in the other direction? And has Christmas taken over the twinkly white lights game, or can anyone use them? Continue fights ad nauseam. While we skipped those particular wedding-related fights, we re-visit this decor debate every single holiday season, while the Pinterest onslaught makes me feel like the most left out person in the world. Typically, by this point in November, I’ve started to feel like an (very sad) outcast from the Internet. Because while I love Christmas, David hates it with equal fervor (something about a lifetime of feeling left out). Plus, we have a Jewish household… that celebrates Christmas… and what do you even do with that? While I’m gearing up to decorate for the holidays, green and red and gold and everything Santa is not helping me out. And after years of trees and garlands decorated with blue and white ornaments (our ongoing compromise), I’d really like something a little more… creative? With that in mind, the APW staff decided to round up the best not-red-and-green-all-over holiday decorations. Here are our picks for seasonal decor that doesn’t scream, “SANTA CAME OVER AND I HUGGED THE REINDEER WHILE HE ATE COOKIES, AND THEN WE TALKED ABOUT BABY JESUS AND DRANK SOME MULLED WINE.” Except for the mulled wine. We’re all obviously very into that. So let’s bring on the subtle, and the sparkles. I hope these tutorials help you decorate your house (if your reason for the season doesn’t happen to be Jesus, or if you’re just tired of red and green), or plan the hell out of your winter wedding. Hot buttered bourbon cheers! Perfect for your friendsgiving feast. Bonus: leaves are basically free! 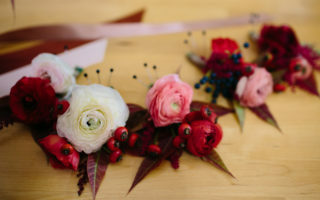 Dried flower bouquets have really beautiful texture and depth. And, you can buy them farther in advance of your wedding and quit worrying about how you’re going to keep them alive long enough in the winter. Metallic spray paint + fruit = instant fabulous party centerpiece. We are all about any DIY project that you can do while watching Parenthood. You could also match your garland to your place card holders by painting them neon. Pumpkins don’t have to disappear after Halloween, y’all! They’re still perfect for November (particularly when spray painted). One of my favorite ideas for an unconventional ring “pillow.” Bird’s nests are home, and you’re making a home together. Awwww…. This has got to be one of my favorite wedding decor pictures of the year. By which I mean obviously you should steal i. Branches spray painted gold is one of my favorite winter decor statements. Plus, it will add some height and glam to your centerpieces on the cheap. It’s called the season of light for a reason. The reason is it’s real pretty. You can’t go wrong with sparkly stars. And for those of us negotiating the Jewish/ Christmas divide this time of year, you can make six pointed stars, and stop the argument before it starts. Sparkle that won’t leave with your guests at the end of the night. Not technically decor, but who cares, they’re glitter donuts. DIY your own mercury glass, or thrift it, but either way you’ll end up with instantly pretty centerpieces. Adding sequins on the table is optional, but recommended. Probably my favorite backdrop of our series. Possibly add a little sparkle to the clouds to winterize them. Mmmm… sparkles. A classy centerpiece idea for non-crafters. Switch up the paper to match any winter decor scheme you’ve got going on. It’s a cake, but it looks like a sweater! Let’s make December all about decor that looks like sweaters, and let peace reign.